It’s common practice for children growing up in the Pacific Northwest to receive a degree of wilderness survival training by the time they’ve left elementary school. The region is thick with trees, making it easy for those who are unprepared to become lost in the woods. If one doesn’t know their way out, they’re likely to find themselves passing by the same landmarks over and over as they get no closer to their destination. The teenage protagonists of Charles Burns’ Black Hole spend much of their time lost and in the woods, although it is the lovelorn Chris who holds the distinction of being literally lost in the woods as she finds herself without the guide she previously relied on. When her lover Rob disappears, she wanders uncertain of her path or destination. Burns wanders, too, as he often doubles back to revisit key moments in the narrative from new perspectives that serve to illuminate character and develop arcs. This technique adds a fullness to the work that might not otherwise be present given the myopic perspectives of the two central figures, Keith and the aforementioned Chris. These characters’ perspectives may be myopic, but it is important to emphasize that the book itself is not, due to its habit of doubling back in time. Keith and Chris can not see past their own lives, never even looking deeply into the interior lives of their romantic partners. 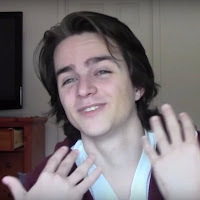 Chris in particular speaks about Rob predominantly in terms of her need for him, and Keith’s view of Chris is colored by his “nice guy” projection on her as the perfect girl for him. The book opens with Keith passing out during a biology class dissection as the universe more or less opens up before him to reveal his path forward. He recognizes Chris as the only student in the class who isn’t laughing at him, and this begins the development of his idealized vision of her as his soulmate. The whole sequence happens across several pages. However, it’s a scant few panels later when we revisit the scene from Chris’ perspective. She feels a worry for the boy (she is a nice girl when she isn’t buckling under extreme stress), but it isn’t anything deeper than that. A moment that means a lot to one person ends up being just that, a moment, to another. A message (it would be presumptuous to call it the message) is made clear— this isn’t going to be a story about this boy “getting” this girl. Burns continues returning to events from new perspectives, giving readers Chris and Keith’s perspective of her late-night swim that reveals the physical deformity she’s developed as the result of a fictional sexually transmitted disease. Readers get her perspective as she undresses and swims, they get Keith’s as he hears the story moments later before watching her undress, and they get Chris’ point of view again as she finds out about the accidental unveiling of her previously unknown condition. These scenes don’t merely flow from one directly into the next. There is material in-between, but the book more or less creates a closed loop in a stretch of pages that makes that section the whole story of that one moment. 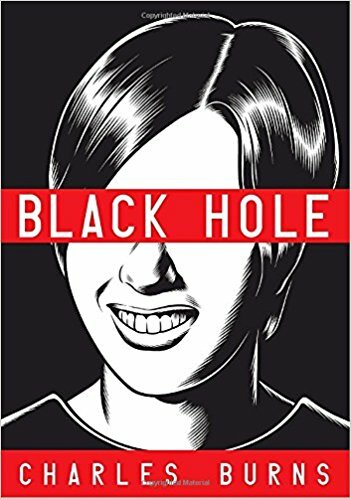 It may have been frustrating for readers of Black Hole as the book was initially serialized to find themselves constantly going back in time to re-explore events, but that structure makes the book sing as a graphic novel collection. This technique is not isolated to exploring large moments, either, as Burns uses it to illuminate minor scenes as well. Chris lies drunk in a bed, remembering/dreaming about her missing beau, and for one panel we see that Keith has placed a hand on her stomach before she drifts back into a symbolically loaded dream. That moment where Chris registers Keith’s “warm and needy” hand rubbing her stomach is exactly that— a single moment. What’s happening around it, her dreams of Keith and the beach that she feels fated to return to, are given importance. The moment plays out from Keith’s perspective in the next chapter and this time it comprises an entire page, revealing Keith’s desire to comfort Chris before his hopes of a potential romantic connection are dashed by her continued fixation on Rob. Keith comes off as kind of creepy from both perspectives, but it’s a different kind of creepy. From Chris’ perspective, it’s easy to interpret Keith’s hand on her as a potentially sexual touching with her description of his “warm and needy” hand. From Keith, though, we learn that he thought Chris was sick and was attempting to comfort her without an awareness of physical contact being a boundary crossing act. Intentions and interpretation are made clear. Keith sees himself as coming to the rescue. while Chris reads him as being needy and almost pathetic. Both are accurate, and that single moment becomes all the richer for that shading of the gap between Keith’s intentions and Chris’ interpretations. As a collection, Black Hole is a work of art opening up and displaying itself rather than simply guiding the reader through a plot. Things happen, they spring logically out of the moments that come before them, but there’s no sense that it’s necessarily going anywhere heading into the back half. Unfortunately, the final stretch of the book does not maintain this graceful act as Burns’ storytelling technique of doubling back to share different perspectives on events are used for the purpose of merely illuminating… plot. In the final quarter of the book, Keith has been allowing a group of physically deformed “sick kids” who have been living in the woods to squat in a home that he has been watching for a couple of family friends. As he smokes weed in the garage, he hears the sound of something like firecrackers before going inside to see that multiple people have been shot to death. The sequence is unsettling as readers experience Keith’s confusion along with him. The push-in on the bullet hole in a dead boy’s cheek is disorienting and enthralling in a way familiar to the experience of getting high and hyper-focusing on a detail. The confusion is sold, but, for once, the randomness of an event as large as this one is distancing rather than enhancing. The reader doesn’t know what could have spurred this on as they haven’t been made privy to the lead-up. For once, it feels like the reader has missed something important. The book then shifts perspective late in the game to the little-seen nor heard from Dave, another sick kid who is revealed later to have been infatuated with Chris and has been attempting to distance her from friends and loved ones in order to seduce her. The reader isn’t granted his internal monologue as they have been when following other characters, but they watch him as he collects a bucket of chicken and murders his best friend before contemplating suicide. It’s jarring to suddenly follow a “new” character, deprived of any insight into his thoughts as we would have been granted with any other character in the first half of Black Hole, and track him on this atypically violent journey. Keith learns from a sick kid about the events of the shooting in detail, clarifying how it happened and how some people managed to escape it. Finally, the reader learns from Chris that Dave had been plying her with booze in an attempt to woo her before making a confession that he loves her and — brandishing a gun — asserting that no one else can have her. It’s a big statement from what had been a minor character of previously unknown motivation. The technique of circling around an event ends up having to do the heavy lifting of showing the readers how and why things are happening. Unlike in earlier segments, where the reader already knows the answer to why things occur, as they spring out of already established elements of the characters’ personalities and relationships, here we’re thrust into the chaos of a moment, shown the character who perpetrated it, see the moment as it plays out, and then find out about the motivation that had not been established prior. It all adds up to a logical turn of events, but the goal of art is not merely to convey a logical turn of events. Nothing new is learned about the characters we have followed throughout the book as they are now artificially pushed into directions that then carry them to the end of their journey. And it is worth noting that the book had earlier deployed what appeared to be random violence to great effect as Chris’ boyfriend Rob is murdered in the woods after leaving her for the night. As he dies, a small mouth on his chest (a result of his status as a sick kid) bemoans that things between him and Chris were never going to work out. It’s the tragic pay-off to dreams and previous messages from the mouth that had foretold an inevitably doomed outcome. It works thematically on a level that Dave’s murder of the sick kids simply does not. After the shooting, Keith runs off with Eliza, a woman he has fallen in love with, to see the sights of the Southwest that she had regaled him with, and Chris returns to the beach where she had spent her last perfect moment with Rob as she considers whether or not she can move on and return to her old life. Yet, these are not destinations that the characters couldn’t have reached without the shooting as the instigator. Keith’s desire to be with Eliza and escape his town had already been established. The importance of that beach to Chris was given a lot of time to develop. Everyone could have made their choices to head off into the unknown without the deaths of several teenagers as an instigator. Chris’ discomfort with Keith’s attempts at affection could have pushed her out of the house (having already decided to return to the beach eventually as she dreamed drunk in bed with Keith), just as Keith’s chance meeting with a happier Eliza at the grocery store was the true catalyst for him to run off with her. The storytelling technique that had previously made the book so full of life and had given it a widened perspective here ends up creating a greater air of artificiality that may not have been the case had the details of Dave’s “courtship” of Chris been made known previously. In trying to piece together the chain of events leading to an instance of mass murder, an event that is, of a certain scale, alien to the pages that preceded it, the story and the reader momentarily lose track of character. Thus the reader ends up lost in the woods trying to discern the trees when the book had been guiding them to observe the forest. Whether or not the reader can find their way out of this tangle depends on how well they’ve ingrained Burns’ instruction on how best to read the book prior to that point. To disengage with the narrative when it reveals the machinery that drives it is a natural response. If this momentary loss of grace is enough to send the reader’s attention elsewhere, escaping from the black hole as the protagonists’ journeys reach their fateful end, then that is a fair outcome.